On Saturday, March 5th 2016 I participated in my first Riley Children Hospital Dance Marathon. I danced for 7 hours at Indiana State University with only minimal breaks. I dance for the kids who can’t. I was interviewed during dance marathon and after “Why did you sign up to do dance marathon?”. My response was always the same; I have never been a part of this amazing foundation and wanted to raise money for the kids because this is something bigger than myself. I was diagnosed with heart disease at age 15 and even though I wasn’t treated at Riley, I want young girls to get the treatment so they don’t get a heart disease like I did.” Most are shocked by my response because as a 1st year participant I have such a strong connection and dedication towards this foundation. Throughout the night we had guest speakers talk about their Riley journeys and it was so powerful that I want to go and help anyway I can. I am so excited for next years dance marathon at Indiana State University. Although my body hurts days after the event it was well worth it because overall the ISU Dance Marathon raised $51,693.51!! Why do you dance for the kids? As many who know me I am obsessed with pizza. It is always my top choice for meals whether it is Pizza Hut’s deep dish, Papa John’s pizza delivered with the tasty garlic sauce, or even the Giordano’s in Chicago famous for the deep dish pizza that melts in your mouth. This delicious meal is always an A+ and satisfying. Although this yummy piece of cheese, tomato sauce “but it’s a vegetable”, and bread is quite hefty on the calories. Ranging with two slices of Peperoni pizza, because who can have just one?, the 625 calories that will haunt you. That is 159 minutes of climbing stairs to burn off those TWO slices of pizza. That is like the longest, and worst workout. So, after all that I decided that giving up pizza would be a good idea for a YEAR. I thought of how many calories I won’t be eating. Giving up pizza will help a balanced diet and help with weight loss. My goal for 2016 is to lose 15 pounds, and getting rid of pizza is the first step. This is one of the hardest decisions I have made, but in order to fulfill your dreams you have to give up things to make those dreams become a reality. What are your New Year’s Resolutions? 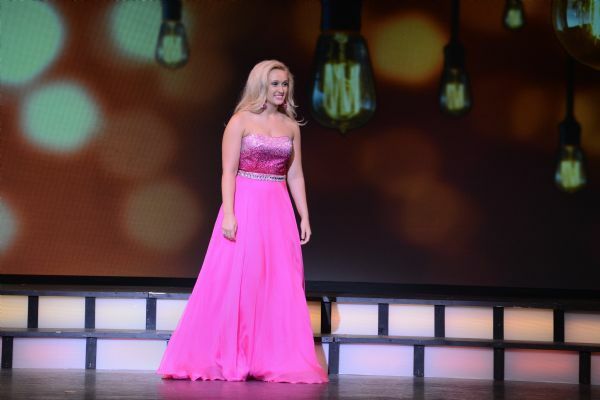 This past weekend I competed for Miss Indiana State University. It was an amazing experience to meet 21 other girls just as driven and committed to service as I am. This was my first pageant in the Miss America system and I can’t wait to participate in more. I am proud to announce I was awarded the Miracle Maker Award (Raising the most money for CMN) and the People’s Choice Award. While I did not take home the crown, I do wish Madisson Brower all the best as she serves her year as Miss ISU. I would like to thank my friends, family, ZTA sisters, and my coach Nicole Pollard for all the support along the way! 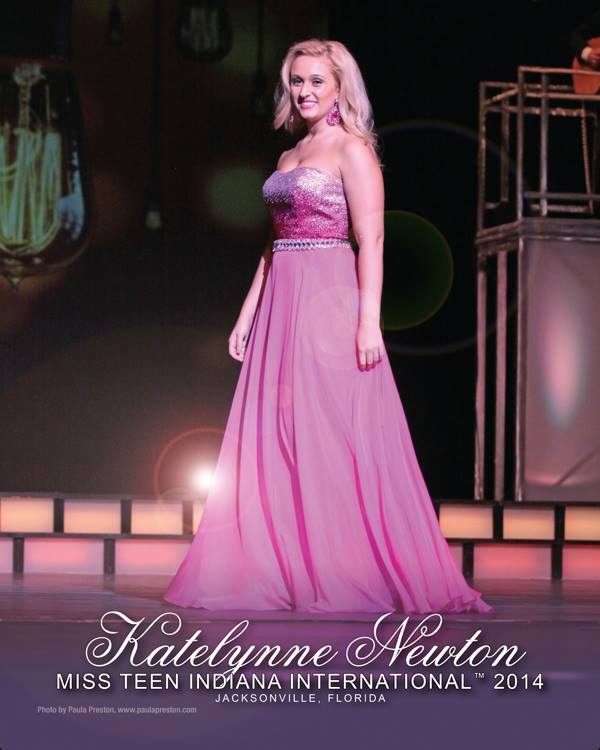 Come Cheer for Katelynne as She Competes for Miss ISU! 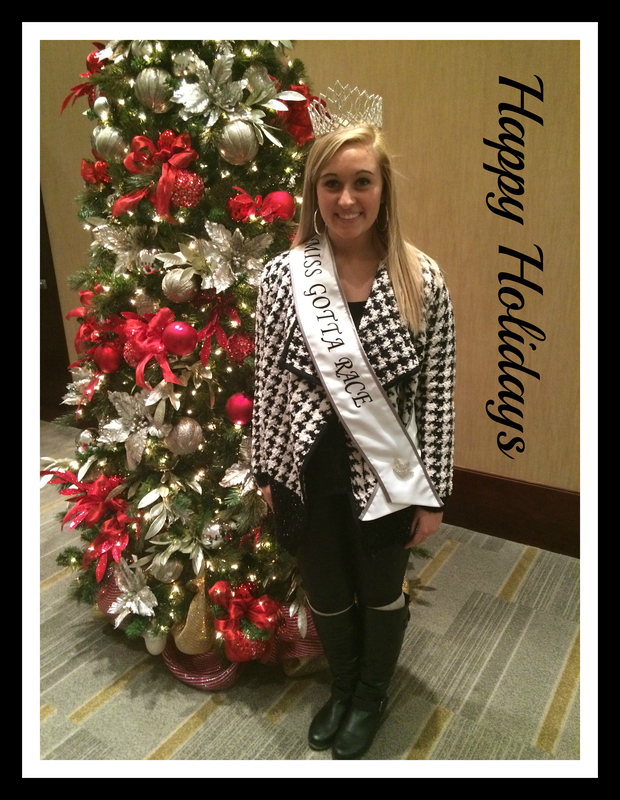 We would love to see you at the event to cheer Katelynne on as she competes for Miss ISU! Hope to see you there. It’s no secret Indiana State University is my favorite school, because I am a proud sycamore. I love attending events that ISU hosts and presents. I would love to share with everyone and especially high school seniors looking for an awesome University to attend. The campus has so much to offer and I have really enjoyed the family-like environment you feel as you walk around. I see instructors and fellow students and not only am I greeted with a smile, but many know me and know my name. You wouldn’t get this same feeling on a larger campus. ISU offers over 87 majors for bachelor’s degrees. 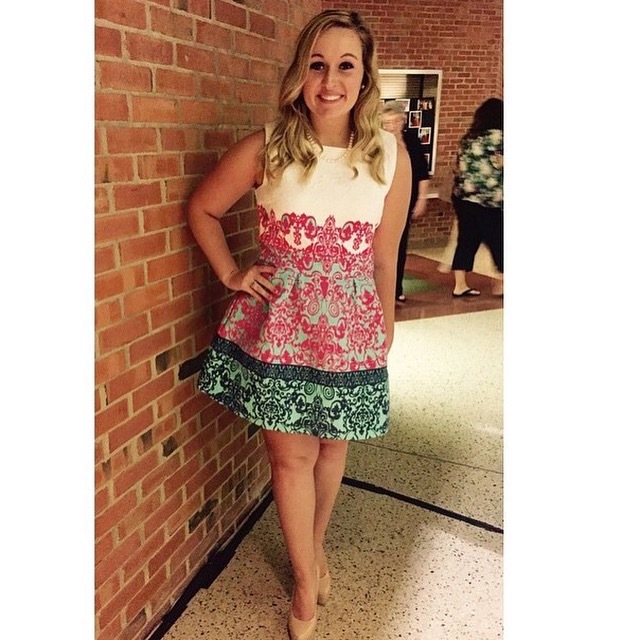 I am lucky to be a part of the Textiles, Apparel, and Merchandising major program. My program has some of the most supportive teachers that I have seen. They truly want to see you succeed in the program. I love being a part of a program where my peers and professors are as excited as I am. ISU is #1 in the Nation for Community Service. I have participated in community service since I was a little girl scout helping out with the nursing home. Every Wednesday ISU has stop n` serves where anyone can stop, swipe their ID, and get an hour of community service by helping out a local organization right on campus. In addition to those events, there are many other days that are dedicated to community service both on campus and throughout greek life. The beauty on ISU campus is something I love about ISU. I love walking through campus and seeing the trees and various sights. The campus always makes sure it is cleaned and ready for their students. The campus is always making new additions and renovations to make it the best for the ISU students. The opening of Normal Hall was amazing- as seen through many pictures. It is so exciting to be lucky enough to live on a great campus where we have great buildings and a beautiful campus. ISU sports don’t charge students a fee for games. Making it more affordable to attend games and get the college experience with attending anything from football to softball to basketball to volleyball games. I love being a sycamore and showing off my blue and white! ISU has a 4-year guaranteed plan for students to graduate in 4 short years. It helps students save money and graduate on time with graduation class. I am proud that our advisors and professors work hard to make sure we graduate in time and have information to succeed in life. Every day is a blessing being able to go to a great school like ISU. I love representing and advocating for ISU, because it has opened so many doors for me within the community and I am proud of the person I have become since I’ve been at ISU. I can’t wait for my years to come and hope that I get to represent the school in the best way I can. As you already know, I’m very involved with the Miss America Organization but you probably didn’t know that one of the exciting opportunities this organization offers is the chance to raise funds for local children’s hospitals through Children’s Miracle Network Hospitals. The money I raise will help save children’s lives, and a portion will also go to support the Miss America Scholarship Fund. Children’s Miracle Network Hospitals makes sure that donated funds stay local which means that your donation helps kids and families right here in our community. I invite you to join me in touching the lives of sick and injured children today, by clicking the “Donate Now” button to make a secure donation. You can also see the impact of your donation by clicking here to view some of the incredible miracle stories from kids we’ve helped. These are just a few stories out of millions of kids treated at Children’s Miracle Network Hospitals each year. Thank you so much for your support and for helping me make miracles happen! 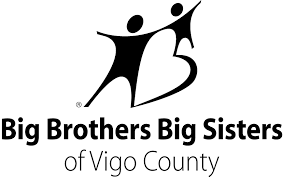 The Chances for Youth program Big Brothers Big Sisters in Terre Haute has given me a chance to be another big sister. I applied about a year ago and after a background check, interview, and a few training exercise I was ready to be matched! It took 4 months for them to find a perfect little for me, and they sure did. She is a complete ray of sunshine. My little loves to dress up, play outside, watch movies, and go on car rides. She’s very adventurous and has a lot of energy. We have so much in common and that is why the Big Brothers Big Sisters program is great at what they do! She loves to get in my car and eat fruit snacks while listening to rap music; it sounds strange but she knows all the words. I also do things for her like teaching manners, going over how to spell, learning good habits, and simple life lessons. I often try to challenge her because she is extremely smart and knows her stuff. I will always throw out big words for her to spell and with a little help she is getting better everyday. We have gone to eat a few times in the quads at ISU. She loves the food and especially the ice cream there. She once told me, “Katie, I don’t know why the boys are mean to me at school.” I laughed a little and explained that if they are mean it usually means they like you. Her reaction was priceless. I love being able to see a smile on a child’s face by just the small things. Whether I have made her laugh or she is having a great time learning new things. Everyday is an obstacle and everyday is a new chapter in our lives that we share. We grow and learn together. One thing I have learned most from the program is patience. It isn’t about what you want; it is about what the child wants and needs. She comes first at the end of the day. I love spending time with my little one thanks to the Big Brothers Big Sisters Program. I have loved being a Big Sister this past year and look forward to many years to come! Who doesn’t love a great deal? Most people make a living or part-time job on finding deals. I have some tips on how to get a great deal and how to save money. First, check your local Goodwill, Plato’s Closet, and consignment shops. Look around and see if there is anything you are looking for. If you cannot find what you are looking for just look around and check your sizes first. It doesn’t hurt to check around because bargains always come up when you least expect it. If at Goodwill, I check everywhere because you never know what you can find. I have found a $100 dress for $6, found a wooden basket and used as a pencil holder for my desk, I have made old jeans into shorts, and I have found very cheap things and made into neat new things. If you check any Pinterest account there is tons of DIY with Goodwill finds. If it is a clothing store like Plato`s or a consignment store, then you have to take the time and look through things to find deals. I usually look through my sizes and if it isn’t under $10 I don’t consider it. Sometimes I will walk around the store with things in my hand and end up buying completely different items because I found better deals. Great deals come and go and its good to always be on top of sales of stores. I like to always buy something on sale but if it is something I have to have then I buy it of course. Bargain shopping is become a popular trend that stores will do anything to make you stop by. Make sure you are watching the sale going on. Check the original price and compare to the sale price. A considered “good” sale is 40% or more off of the original price. Always do your research when dealing with bargain shopping; especially when you have a device right in front of you that can tell you a lot about the value of the product. Hope these tips help you score awesome bargains. Always remember to do your research, look at items that you originally didn’t come in for, and keep an open mind while bargain shopping. It is important to always spend time with family because no matter what you have going on in life they will always been there for you, mentally and physically. Putting away stuff from your college room can be hard because you have twice as much room and stuff now. Start early in the summer, and each day do a little more to help with the load. You’ve spent all year away from each other, and it is nice to catch up with some old friends. It helps keep your brain cells moving so when you return to school you are ready to learn. I have always done every summer because sometimes it is hard to do the easiest task because you have not done any writing or reading. Summer can seem long and boring, but getting a job will help the summer go by faster. There are tons of jobs to apply for such as; retail store, grocery store, movie theatre, babysitting, nanny, or fast food. It’s nice outside be sure to go out and get some fresh air. Have fun and take pictures to remember the fun! Whether it is school supplies, clothes, or dorm furniture to get for the school year. One of the most common places that young adults and moms shop is Target. The Target.com information states that the median age of guests is 40 and the average income is 64K. 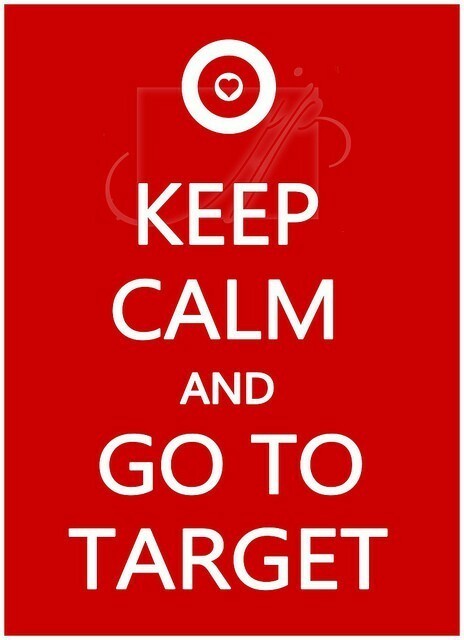 Target is home to many things including apparel, food, office, home, and upfront food stops. My thoughts while in target are based just about every time I take a trip to my local Target. I am usually not in any hurry therefore I could take hours in my local Target just looking around and buying things that I do not need or have convinced myself that I do need in order to survive. 1. I head straight towards the apparel. I check for sales first and then base the rest of my target trip on that. There cheap t-shirts and tanks are a frequent stop. The comfy clothes are always in my closet! 2. Second, I will lean towards the active and socks. As a dancer I always need new socks. They are great gifts and so stylish with all their different designs! 3. The next stop will be to check out the new make up along with the new handbags. I can always use either and end up buying something while in this section of Target. While at this point I am thinking to myself how much I have spent and how much left I can spend without going into debt. On a college students debit card is a lot smaller than the Moms that come in and don’t have a limit. 4. While thinking, holding, and walking around leisurely I start to get hungry and head towards the food aisle. I realize that I am craving something like Qdoba or a cheese pizza. 5. So then I think that I need pencils; You can never have too many pencils especially during the school year. I look towards the cute decorative office supplies while storing up for the school year. After I have looked the whole store and spent most of my paycheck, I decide its time to go and that I probably need to head home and do something more productive. Although impulse buying is fun and “relaxing” it can hurt your bank account and leave you with a big bill. Always watch what you spend on your account and plan ahead. Going Greek isn’t always the first thing girls think about when they go to college. Some girl’s focus on school, boys, or partying and don’t even think about rushing to a forever home. I signed up for recruitment the second it was opened in August. I was so excited to make new friends that would last a lifetime, learn new things about an organization, and be apart of something that “Isn’t for 4 years, its for life”. When you first move in all Greeks come together and help you move in. I had a group of girls from Alpha Sigma Alpha move me in and they were obsessed with all my brand new dorm stuff that I got at Target of course. They immediately asked if I was rushing and I had told them I had thought about it. The Greek system has many events leading up to recruitment. I went to a Greek carnival and a Greek fair explaining what all the organizations are about. The week of recruitment is tiring and a lot of talking. You start out at every house and then each night you narrow down until you have 2 left. Preference night is very emotional and it is when you choose who you think will fit you. I went to Sigma Kappa first then I went to Zeta Tau Alpha. Worried I wouldn’t get into Zeta I could barely talk. My big sister now talked to me at preference and I was so nervous. I was frozen in the moment because I wanted to be apart of this sisterhood. After preference you sit in a room with a bunch of girls and you wait until it is your turn to choose your home. I couldn’t sleep because I was too anxious and nervous. I could feel my heart beating through my stomach and thinking about how I would feel if I got either house. The day of bid day was so overwhelming but exciting at the same time. I awoke with my roommate and we ventured out to get breakfast at the commons. I could barely eat I was so nervous. I knew my roommate wanted a different sorority than I did, but we would still have fun and be friends. After getting ready and mentally preparing myself for the crowded room of girls anxiously waiting, I sat there on my bid for a whole hour. We had to wait because of some rules. Finally the moment had come to where I could open my bid. I read it and I saw Gamma Chi, which is my sororities’ chapter name. I was so confused I started crying because I thought I didn’t get the house I wanted. 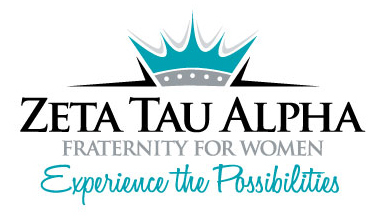 Until a rho gamma came over and explained that I received a bid from Zeta Tau Alpha. I immediately shifted tears from sad to happy tears. Each group went in order to the fountain to where they would run to their house as a large group of screaming girls. I was group 3, so I had to wait behind 2 groups and I could feel my heart beating through my ears. Finally it was my group’s turn. We all lined up and I had clung to a girl I found that was also running to Zeta. I looked at Lindsey, my big sister and the girl who talked to me on preference night, and she looked so anxious. Her face was priceless and I will never forget running right to her and immediately crying because I was home. She had made me feel so welcomed and made me a part of something I will have for life. When girls say that their sorority is not “just for 4 years, its for life” I truly believe it. These girls mean the world to me and I would drop anything for any one of them. I know they would do the same. I have found my best friends and my future bridesmaids, long lasting fun nights to remember, and something to call home. I will never regret going Greek and I think that girls should consider it more because of what you get out of it. It has changed me for a better person and I like who I have become because it is something I am proud of. Of course it is tradition to celebrate National Pancake Day and help support Children’s Miracle Network with my Miss America and Zeta Tau Alpha Friends. Such a yummy way to help out a great cause! I had an excellent birthday celebration visiting Daytona Beach, Florida. While it was still a bit cold, it was beautiful weather. I was able to go horseback riding on the beach. Great fun with family & friends. As I write my farewell letter to close out my year as Miss Teen Indiana International; I can only remember all the great times I had. I will cherish them forever. This letter is to highlight my year, no tears. 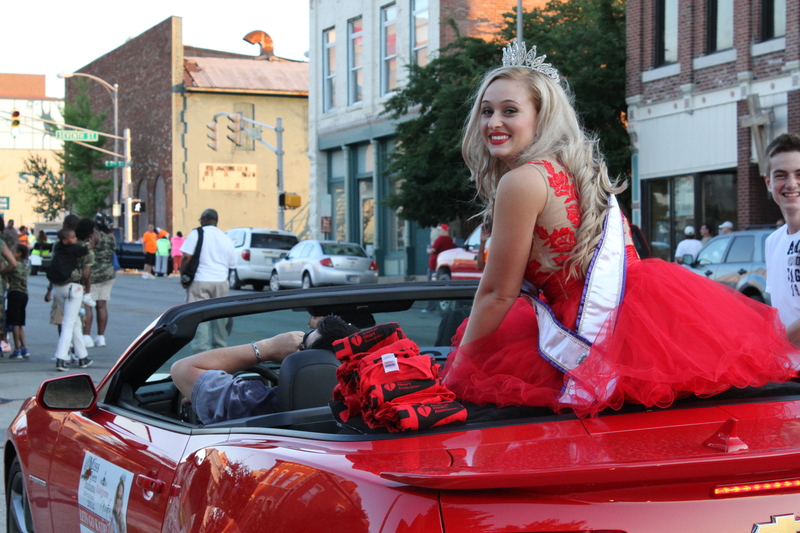 I began my journey the day after Christmas of 2013 with a phone call from Ms Mary Richardson saying, “Congratulations Katelynne, you were chosen as Miss Teen Indiana International 2014. I wish you all the best.” What a gift to receive! Even then I did not realize the impact that this year would make on my life. So, I would first like to thank Mary Richardson for the opportunity of a lifetime. The International Pageant system is an experience that means the world to me. You have offered me an opportunity to share my message, the chance to improve myself personally and professionally, and the amazing chance to make new friends along the way. I thank you for your encouragement, kind words, and support throughout my reign. You are changing the lives of so many young women today, and for that I thank you. One of the things that attracted me to the International Pageant system was the emphasis they place on giving back and finding a way to serve in your community whether it is on a local, national, or global scale. As part of the process, I had to identify a cause in which to dedicate my time, and and with that in mind, I found a second home. The American Heart Association gave light to my title and to my life. I was so inspired with their belief in me and my power to change lives with my own heart story. Being diagnosed with a heart condition just means you have a bigger heart to give out more love, someone close told me that to make me not worry. When I was first diagnosed, it was a very scary time for me. My family and I coped with it through education. That is one of the reasons I chose the American Heart Association as my platform to give back. By helping the AHA, I was able to share my story and keep learning along the way. 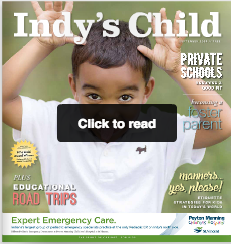 When people heard my story I felt like there was a renewed sense of hope within many across Indiana. Thank you for everything AHA, I will be eternally grateful. Where would I be without my life-saving Nicole Pollard. You are not only my coach, but a trusted mentor and what I consider to be a true friend. Thank you for the advice, coaching and friendship. You continuously support and believe in me, even when I didn’t. I don’t know where I would be without your advice and expertise. You are so talented and are giving girls so much in return. Thank you, and I love you so much. I can’t wait to see what we work on next! 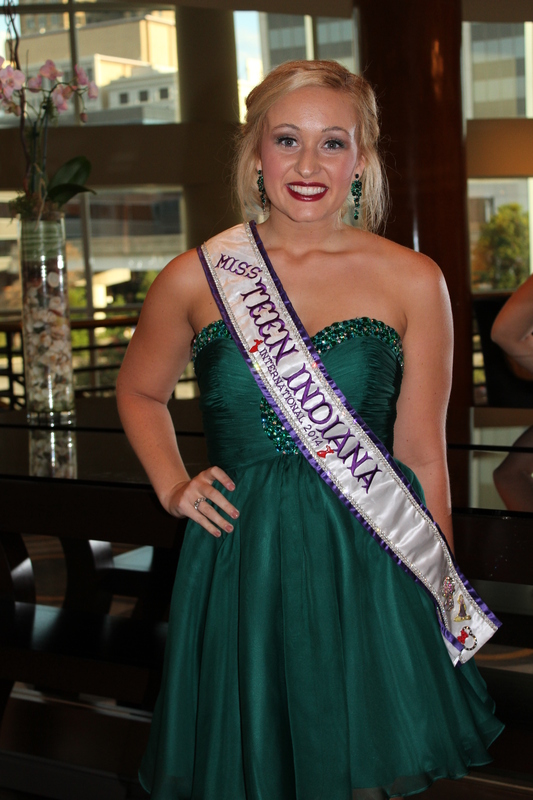 To the sponsors who gave their donations and their hearts to Miss Teen Indiana International, thank you. You dressed me, donated to my journey to Jacksonville, and gave your best expertise to make me a better teen contestant. 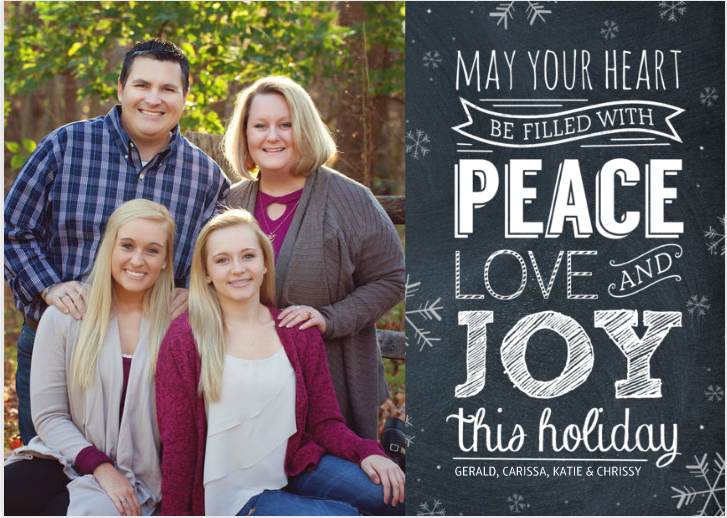 There were so many that it is tough to list you all, but know that my family and I appreciate all of your support during this last year. Chrissy, my little sister who would rather not claim me, Thank you for your calming thoughts during Miss Teen International and your endless support, even during your sweet sixteenth birthday. To my crazy, yet loving parents who acted as manager, director, sponsor, and non-stop taxi for me- thank you from the bottom of my heart. I have no words to describe how much you have helped me flourish with my reign. The endless amount of love and encouragement you gave me was appreciated and will never be forgotten. I can always count on you and know you have my back. I remember my dad giving me a little kid crown before my first state pageant saying, “You will always be a princess to me” and I will never forget that moment. You guys always believed in me and put up with my mood swings when I was having my rough days. I love you both. Thank you everyone. This year has taught me so much that I will continue to use in my lifetime. This past year has been rewarding and exciting combined with my graduation and journey to college. I have BIG plans for 2015 and am currently working to achieve those goals both professionally and personally. So for now, I bid you farewell as Miss Teen Indiana International 2014, but look for new adventures to come and wish me luck! See you at the 2014 Dirt Track World Championship this week! The most important thing to think about is that you take on what you personally can handle. I have found many activities that keep me busy and that can sometimes be hard on a person. My senior year I took on being on the varsity dance team, being a secretary for National Honors Society of Dance Arts, pageants and eventually becoming Miss Teen Indiana International, and all the responsibilities that go with a title. On top of all of this, I had to focus on school and squeeze in time for friends and family. Keeping myself busy led to great achievements and I wouldn’t change a thing. There is a time where I got super stressed and needed ways to help. 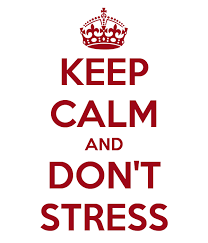 I will inform you of 3 steps to deal with stress. Step #1- Always keep a positive outlook on your busy schedule and towards your peers. When we get stressed out we tend to take it out on others and that leads to conflict if that person doesn’t realize what kind of stress you are put under. By staying positive you can get further with people and be able have many connections to where peers will help. Step #2- Take everything one step at a time. It’s great to be able to multi-task but you need to have times to breathe. I always made sure I would get enough sleep and plenty to eat so I wouldn’t pick up any bad habits. By taking your obligations one step at a time you can do the job more efficiently, and that will create a more positive outcome. Step #3- Make sure you give yourself a break every now and then. If you are handling a lot; over time it will catch up to you. If you are doing homework take a break and go for a walk, If you are working on a big project and are stuck, go out with friends or family, or if you are stressed out about a big competition take a small nap to just recollect your thoughts and relax. The most important thing to remember is to relax and have fun. It’s not healthy to put too much stress on yourself, so if you are feeling stressed I hope you find my three easy tips to stay stress-free helpful. Today, I visited the Indianapolis Museum of Art today on a mission to complete an assignment from my Art Appreciation class. I recruited my family to come along and help. We had a great time viewing the art and learning new things. I even saw a very cool fashion exhibit that highlighted clothing styles over the years and how fashions have changed. When we left, we stopped by the IMA’s Hundred Acre Woods to view the Funky Bones exhibit that was recently in The Fault in our Stars movie. So cool to see something here in Indy from the story and the movie. Well, my assignment is completed and that’s Art Appreciation, Newton Style! Living at home is thought of as being warm and having everything you could need. I love being home with my family and spending time watching movies. 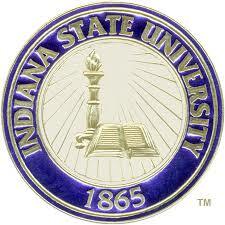 This past month I moved to Indiana State University where I found my home for the next four years. Ever since I stepped foot on this campus I fell in love with it because of the culture and the surrounding people who make it so warm. I recently moved into Hines Hall. I moved in with a new best friend and we are loving sharing a space together. Luckily we got the premium dorms and have our own bathroom and a walk-in closet that has so much space and room to hangout. Pretty rare for college dorms, so we are excited about that. We love our neighbors and always have our door open to meet new people. Starting classes was an adjustment from high school. Having a schedule that is condensed in some areas and wide open in others…I can see that I am really going to have to learn to be effective with my time. I am so excited to start learning about my major. Indiana State cares so much about their Fashion majors and helps us with everything and anything we need. The program is growing and the more students they can get, the more the faculty they can get as well. I’m so excited to begin a new chapter in my life here at Indiana State and then in my career. Thank you all who have supported me in my journey and who keep supporting me towards my dreams. I will still be out and about on occasion! In fact, you can find me this weekend at the American Heart Association’s Annual Heart Run/Walk 5K. I will be there handing out superhero capes, sharing my story and cheering the athletes and families on. Come visit me and you too can have a ton of fun celebrating your heart heroes. And last but certainly not least, I am excited to have just complete Sorority Rush Week and am thrilled to be a Zeta Tau Alpha Pledge. I will share more about that in my next post. Come join me next weekend at the 2014 American Heart Association Heart Walk! I will be coming home to Indy to volunteer and cheer everyone on at the Heart Walk. I can’t wait to see everyone there. Say a Prayer for Katelynne Tomorrow! 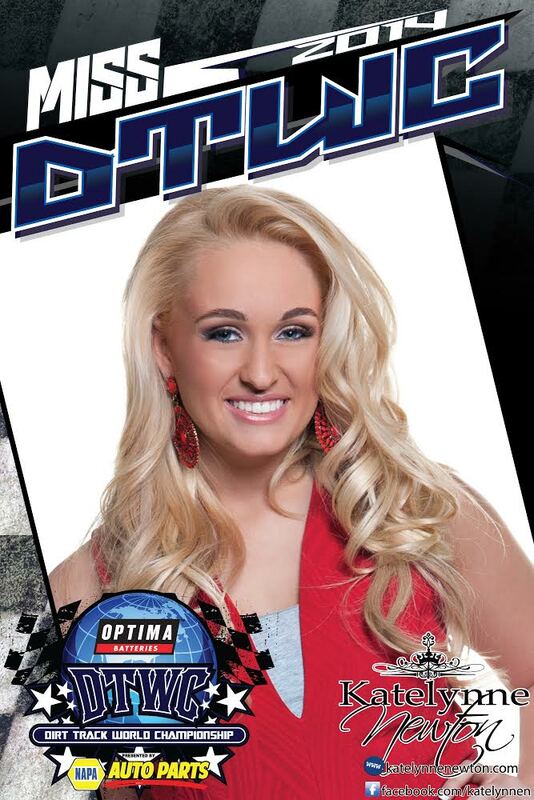 Tomorrow is Katelynne’s BIGGEST day of the pageant as she competes in Interview, which is 40% of her entire score! During this time she is able to share the story of her platform (advocating for heart health), talk about what she has done this past year and what her goals are in the future. Please take a moment to wish her well and tell her you are thinking of her on this day! You’ve GOT this Katelynne! This is what you have worked so hard to do. Show them your inner beauty and the rest will shine though. We love you! I’m so excited to be here! I have worked this past year preparing for this opportunity to continue my “Spreading the N.E.W.S.S.” about heart healthy habits for children and teens. Yesterday kicked off the pageant with Orientation and meeting all of my sister teen queens from around the world. It’s so exciting to make new friends and be able to learn what other girls are passionate about. This is an amazing group of young women and I am honored to be amongst them. I also want to thank the International Pageant staff as they have been so very welcoming and helpful. Here’s to a great week! Fingers crossed and prayers appreciated. Love you all and will keep you updated on my week here in Florida representing Indiana. The Journey Begins #capturethecrown-SO EXCITED! 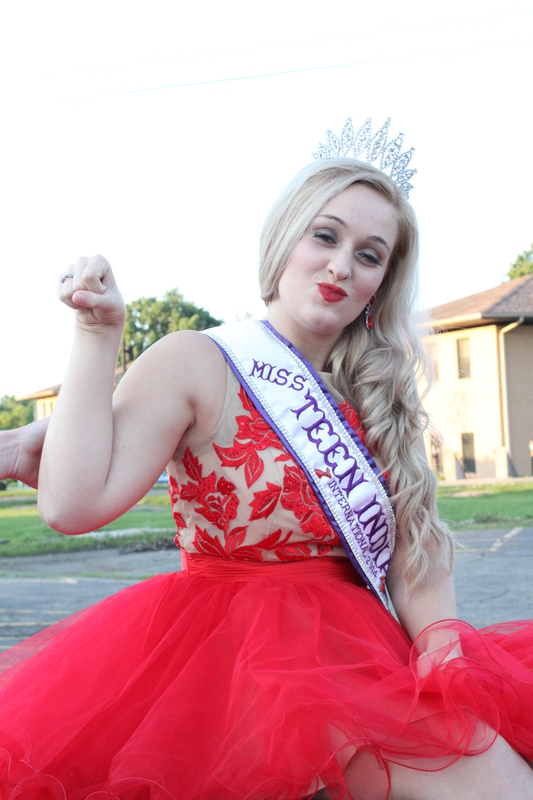 Tomorrow I leave for Jacksonville, Florida to compete for Miss Teen International 2014. I am so excited and grateful for this opportunity. I also can’t wait to meet all of the contestants and staff. Please keep me in your thoughts and prayers over these next 10 days. We will be posting lots of updates and photos throughout the week. Please use the hashtag #missteeninintl2014 #teaminintl so I can be sure to see everyone’s support and love! SURPRISE! My friends are the BEST! Join me for Tea in Wonderland! 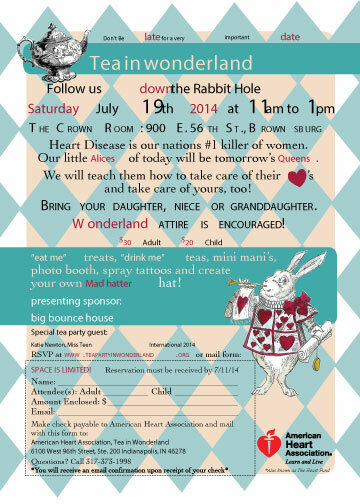 Join the American Heart Association as we celebrate and inform our daughters, nieces and granddaughters about heart disease and stroke with a Tea in Wonderland! I will be there and will be talking about my Bradycardia and how I don’t let having a heart condition hold me back! But first…make sure you come to the Tea in Wonderland on July 19th to hear my story! I will be there to share my story & take photos with the attendees…..come dress up for the day and have tea with me and my American Heart Association friends. Learn how to be heart healthy and active, just like me!